A Micro Blog (that’s like a Micro Brew, only different): Two Butterflies and a Virus. This is a short blog meant to share some observations in a timely manner and to ask for your input! This Red Admiral was one of at least eight that I watched feeding last week upon an Autumn Olive that was flowering in a dry woods. 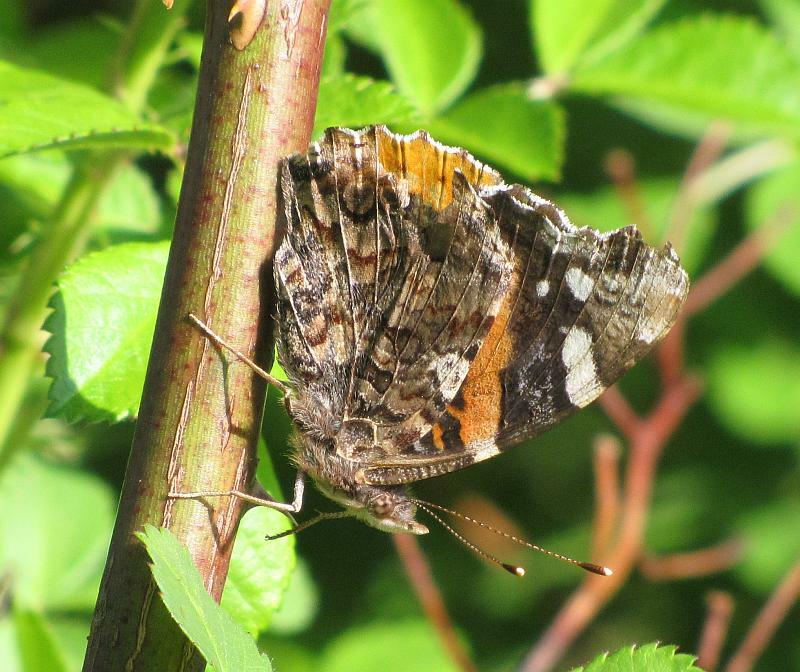 Red Admirals have good camouflage on their underwings and can disappear into the bushwork. Observation: The Red Admirals are a bit dense this year. Like several of our other butterfly species, including Monarchs, Red Admirals are a migratory species. They usually do not survive Northeast winters, and each year we are repopulated from the south (i.e., Carolinas or farther south). For reasons not fully understood, some years we have a Red Admiral deluge, and some years they are few and far between. This year is a deluge year. Apparently, there is also a southerly migration in the autumn, but it is less massive and less well documented. 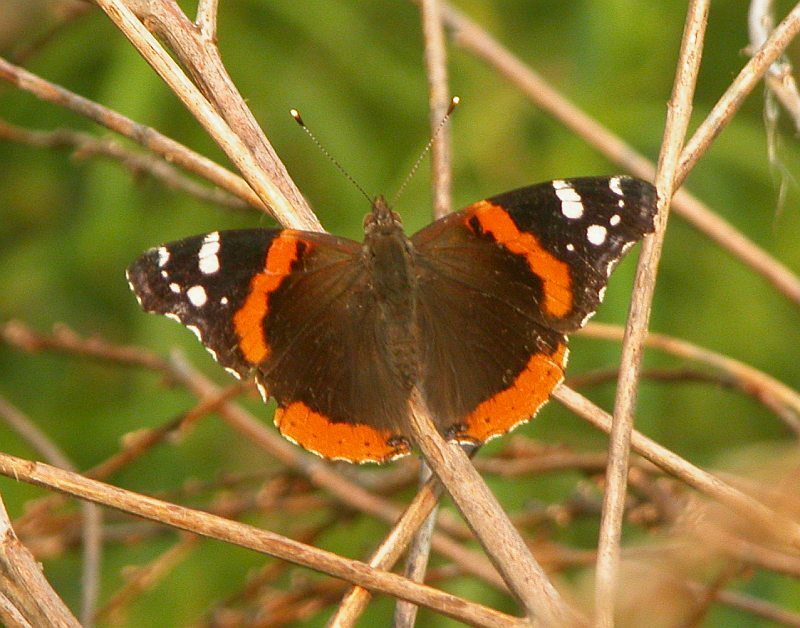 Look for Red Admirals on a mission; usually, one sees them making a bee-line in a generally northerly direction. However, they’ll also stop to nectar. This week I counted at least eight nectaring at an Elaeagnus (Autumn Olive) near Harlemville; elsewhere, I’ve seen them visiting Dandelions. These are medium-sized butterflies, smaller than most Monarchs larger than Cabbage Whites. The orange bands on the dark wings are characteristic and easy to spot, even when they’re on the fly. The underwings are cryptically colored and, with a close of the wings, this butterfly can disappear into the leaf litter. The caterpillars feed mainly on nettles and so, when it’s not a boom year, the best place to find this species is in the nettle-rich floodplain forests. Questions for You: Are you seeing this butterfly in the County? If so, where and how often? We’d be curious to know if they’re showing any tendency to follow the Taconics or the Hudson as they move north. Giant Swallowtails are… giant: wingspan pushes 5 inches. Although the Giant Swallowtail is dark with yellow highlighting on top, its underwings are mainly yellow with dark detailing. A bit of both top and bottom. This image does show nicely how the fore and hind wings of butterflies are clearly separated, unlike moths whose wing pairs tend to be linked together by a velcro-like strip. Observation: Another southerly species that has been making its appearance in the County is even more conspicuous: the Giant Swallowtail. This is our biggest butterfly. Although noticeably larger, from the top it does somewhat resemble a Black Swallowtail, with its yellow bands on black background. 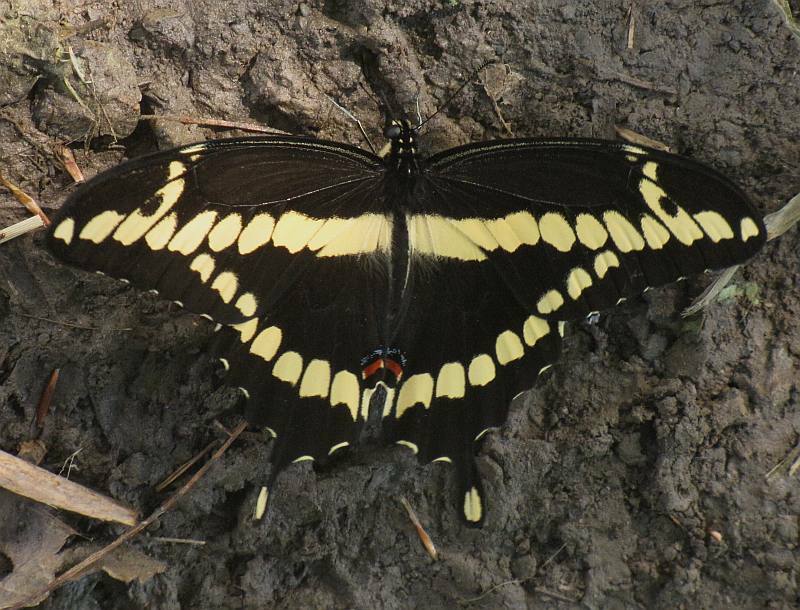 Underneath, however, it is more similar to a Tiger Swallowtail with black marks on a yellow field. 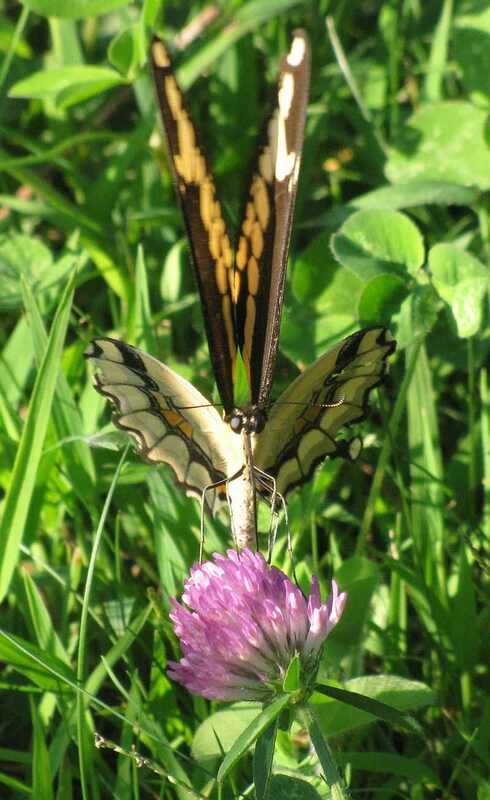 The heart of the Giant Swallowtail range is traditionally south of Pennsylvania. However, last year it was seen at several spots around the region, including in Columbia and Berkshire Counties. Unlike the Red Admiral, some of this species’ northern outposts apparently do over-winter, with new adults hatching locally from pupae in the Spring. The last great Giant Swallowtail outbreak was apparently in the late 1800s. Time will tell whether the current visitors are here to stay or just another passing foray. 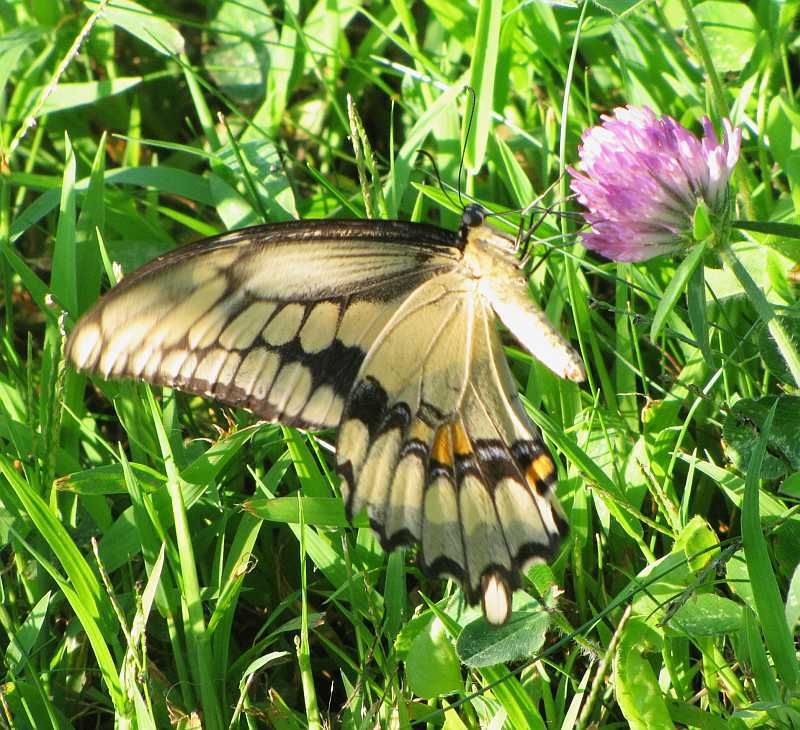 Earlier this week, I saw Giant Swallowtails at two separate sites in Ancram. The food plants of Giant Swallowtail are a little bit mysterious. In the south, it feeds on citrus, farther north it feeds on other members of the Rue family. In Columbia County, a neighbor has observed them laying eggs on an exotic garden rue, and they may also feed on Prickly Ash (most common in the southern part of the County). Questions for You: Did you see this species last year? Have you seen it yet this year? If so, do you have Rue or Prickly Ash in your area? We are curious to know if the early spring exemplars of this species represent migrants or local hatches. Multiflora Rose is being affected by Rose Rosette Disease. The most obvious symptoms are scrawny, reddish leaves. Infected bushes reportedly usually die within 5 years of infection. Observation: Rose Rosette Disease, apparently caused by a virus and spread by a mite, has been inching into the area. Although it can affect other kinds of roses, Multiflora Rose, an exotic but widespread species, seems to be the most susceptible species. We have recently heard of extensive Multiflora Rose mortality from this disease in NJ, Wisconsin, and in Orange County to our south. While rose gardeners fear the disease, farmers are often glad to have it given Multiflora Rose’s invasive nature on farms. 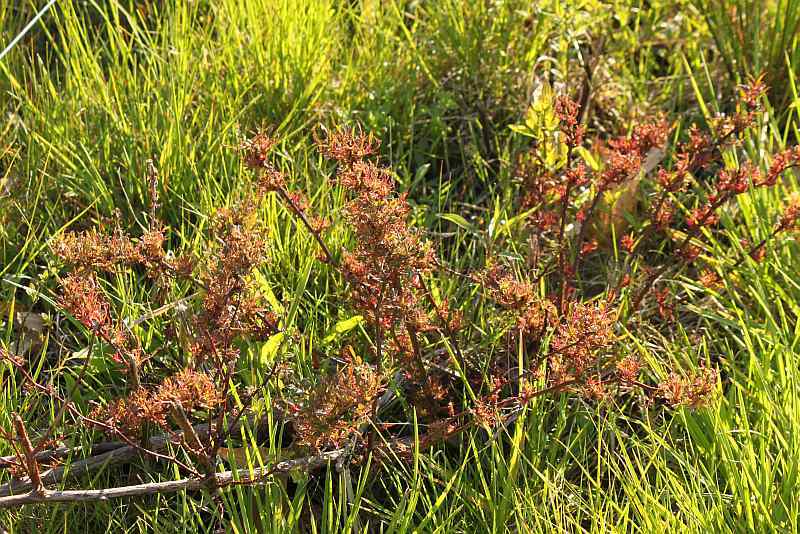 While the quashing of Multiflora Rose might ease the introduction of native plants and farmers may celebrate its passing, birds, rodents and rabbits may miss Multiflora Rose’s ample shelter and food offering. This year, the virus seems to be common around Hawthorne Valley Farm pastures. We have been regularly finding Multiflora Rose plants with the characteristic reddish, elongate leaves. We even found a bush that already seemed to be largely dead. In one area it seemed as if recent re-growth was being especially hard hit. For more on this disease and its symptoms, visit this Missouri Botanical Garden web page. 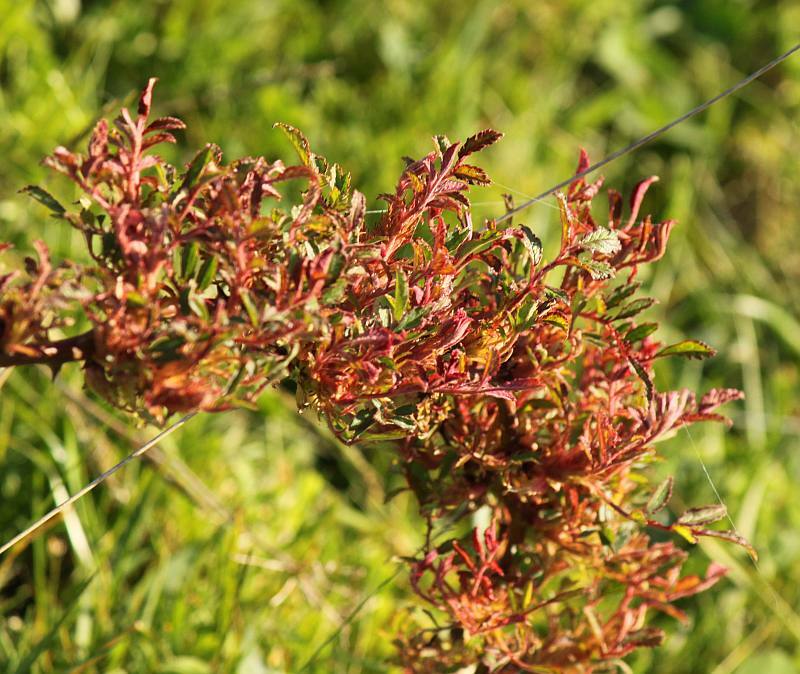 Questions for You: We’d be curious to know how common this disease is elsewhere in the County and whether it is affecting any of our native roses (i.e., Marsh Rose and Pasture Rose). Are you noticing this disease this year? Did you see it last year? Roughly where in the County did you see it? Have you seen it on any other rose species? That’s it! ‘Micro’ this was meant to be, and micro it will be! 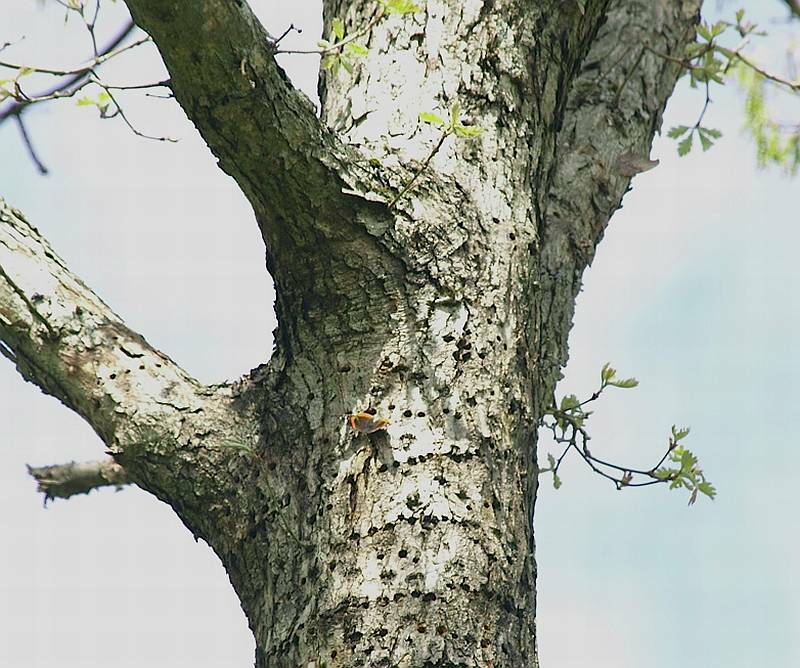 John Piwowarski recently took this picture of Red Admirals feeding on sap from the holes of Sapsuckers (there are at least two in this picture). 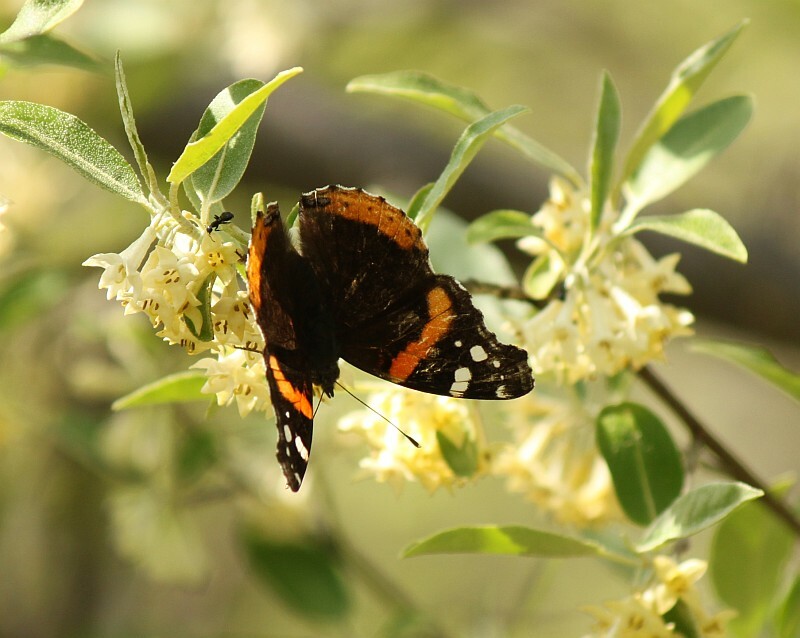 Like several other early-season butterflies, Red Admirals will seek sweet sap at tree wounds, something that can supplement scarce early-spring flower resources. Red Admirals do also feed extensively from flowers when they are available. Please see the additional comments of others below.